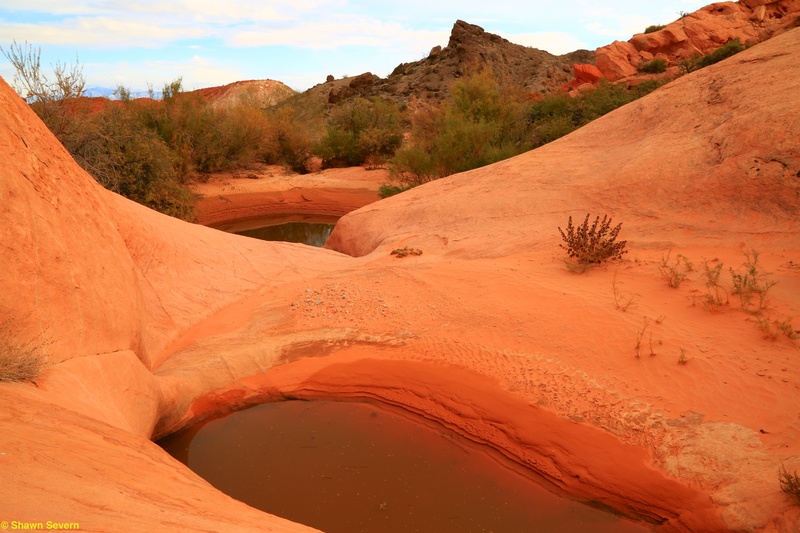 The first thing you need to know about camping at Valley of Fire State Park during the Thanksgiving holiday is that it is busy. The campsites in the park fill up quickly. We arrived on Wednesday around 10:00 am. The park staff at the west entrance gate told us that there were only a few primitive camping spots left at the Arch Rock campground. However, we boldly decided to take a chance and drive through the Atlatl campground where there were some sites with electrical and water hookups. To our surprise, we found an open campsite with hookups. The campsite had a pretty significant grade; regardless, it became our home for the weekend. Our goal for the weekend was to capture some pictures for our photographic portfolio. We had a loose plan to capture some landscapes photos in the morning and at sunset and maybe try for some moon, light painting and star photos after dark. We were traveling with our elderly dog Prince, so our photography had to accommodate his schedule. There was a time when Prince would have been up for long hikes into the desert and been happy to have been up from sunrise to sunset. Now, at 14 years old, he finds our hiking schedule too aggressive. So, getting up early in the morning for a dog walk before we head out with cameras makes it difficult to plan any photo sessions at dawn. After Prince’s walk, we can leave him in our RV for his morning nap and we set off for our planned hikes. We returned each day at noon and spent time with Prince for another dog walk and sitting out outside at our campsite. Then after dinner, we could get out for another photography session. 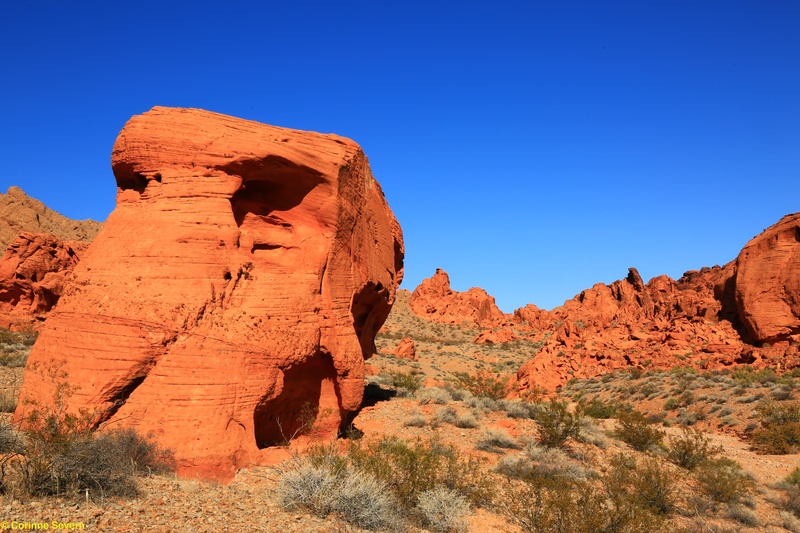 On our first evening at Valley of Fire, we went a short distance from our campsite to Arch Rock. We had done a little research and reviewed the location in the early afternoon. The full moon was going to rise shortly after dark on an angle that might allow us to shoot it using the Arch as a frame. Although we had nailed the planning, our equipment was not quite up to the task of getting the photo we wanted. The moon was full and bright, but our flashlights were not sufficient for lighting up the foreground of The Arch. 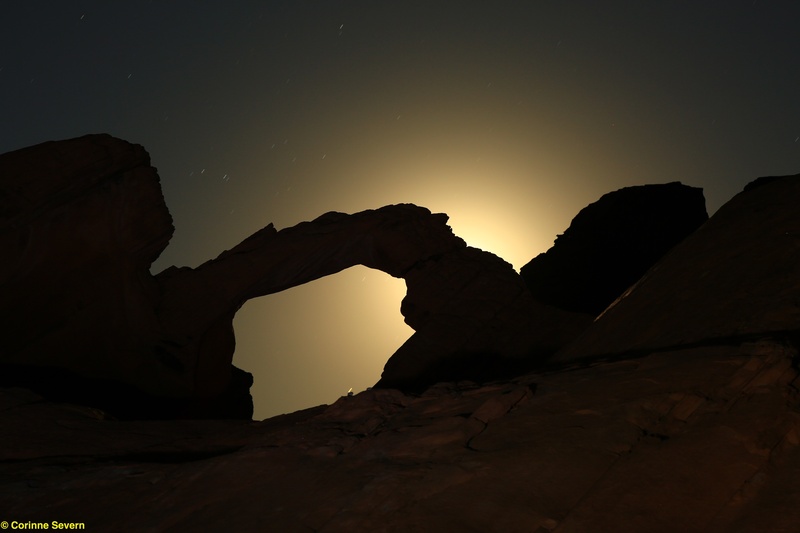 We did capture a couple of nice pictures with the moon backlighting The Arch. After of couple of hours of working the scene, we were both cold and it was time to retreat to the trailer for a hot drink. On Thanksgiving morning, we hiked the Prospect Trail. This is a wonderful trail that can be followed to a junction with the White Dome Trail. We planned a shorter 2 mile walk up into the pass where there are a series of interesting rock formations. We had planned to spend about an hour among the rocks, but in the end we spent the entire morning working around the rocks. The light was pretty good for mid-morning and finding great compositions was challenging and fun. Friday morning we had planned to do two hikes, one on the Duck Rock Trail and one on the White Dome Trail to shoot the slot canyon once the sun was a little higher in the sky. It was a short hike out to Duck Rock. Unfortunately, at the time we arrived, the angle of the sun and thick cloud layer made shooting very difficult. We tried to capture a decent image from a bunch of different angles. We walked to the far side of Duck Rock (it doesn’t look like a duck from that side) and we even hiked up an adjacent hill but nothing we did resulted in a composition that we liked. Before we returned back to the car, Corinne suggested we continue down the wash to see if there might be something of interest a little further along the trail. We scored! Being open to walking a little farther can be the biggest factor in finding wonderful landscape subjects. Less than a quarter mile down the trail, we ran into a series of natural tanks. These are depressions that hold water. Tanks are rare and important to the desert habit. They provide water for local wildlife. From the rock ledges above the tanks, the entire valley opened up providing a very interesting vista. The geology in the area is very colorful. We spent hours moving around the rocks, trying different compositions. We spent so much time at Duck Rock Trail that we never made it over to White Dome Trail. It was getting on to early afternoon and it was time to return and spend time with Prince. 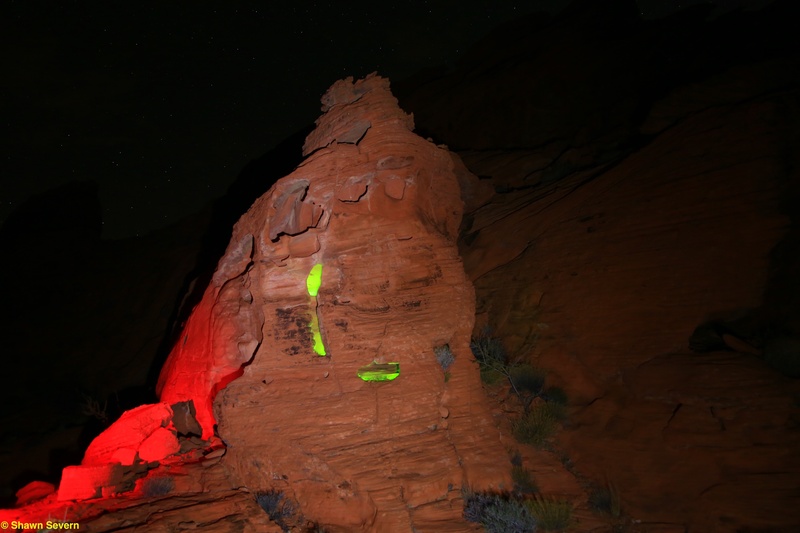 Friday night found us out doing some light painting of the rocks near the campground. Shawn gets a kick out of creating unexpected scenes on the rocks. Corinne was more interested in getting a photo of star trails. Unfortunately, right after we decided to switch from light painting to star photos, a cold wind started to blow. Even with heavy cameras and excellent tripods the camera shake was very obvious. Furthermore, the temperature dropped from being merely cold to uncomfortable! It was time to retreat to the RV for a hot drink. On Saturday, we returned home to Las Vegas. It was a short but fun trip. Now it is time to see if we can make the most of the photographs we captured. Prince got us up twice during the night for trips outside. We slept in until 8:00 am or so. Once we were up, showered and dressed, we took Prince for a longer hike on the BLM land behind the campground. The temperature was still brisk, but there was no wind this morning. There was snow on the ground and the temperatures were close to freezing. However, we were hiking under a bright blue sky. We enjoyed the opportunity to have a good long walk and to let Prince off the leash again. Prince found lots to explore and had the chance to chase a couple of ground squirrels. When we were back to the RV, Corinne made some pumpkin spice pancakes with pecans. It was nice to have a hot sit-down breakfast rather than our usual breakfast bars. After breakfast, we did a number of chores. Corinne vacuumed the carpets. Shawn packed up some of the clothes into travel bags to prepare for transfer from the RV to the house. Shawn got the Jeep hooked up, emptied the holding tank, and checked all the engine and heating system fluids. Although this resulted in a later start on the road, it meant that we had some of tidy up completed in the pleasant setting of the campground rather than a storage yard. The weather was much more pleasant today. The sun was shining and the winds were much lighter. The trip was quite easy until we got back to Las Vegas. There a construction project on I-15 in the center of Las Vegas. They had traffic limited to one lane. Essentially, that meant that there was a traffic jam for about 10 miles. We decided to go around the perimeter of the city which added some distance, but probably saved some time. Unpacking went smoothly, although a security person came to tell us that we weren’t allowed to have our RV in front of the house while we unpacked. We made appropriate apologies and said we would finish shortly. In fact, we were completely unpacked in about an hour. Then we took the RV to the storage faculty without difficulty an picked up some “naked” (no sauce) ribs from Dave Famous BBQ for dinner. Trip completed! Prince had a very bad night. He was sick and had the runs. Corinne ended up spending most of the night getting up to walk him. He was clearly uncomfortable and just couldn’t settle down. So we didn’t sleep well and we were a little less energetic this morning. It was cold this morning. We walked Prince around various areas within the campground and up and back the driveway. Corinne made Prince some rice for breakfast, which seemed to settle his stomach. After his rice, he seemed a little happier. Thankfully, he was fine most of the day and settled down on the RV, dosing and sleeping most of the day. We didn’t waste too much time before we were out on the road again. Since we had stayed in Mountain Home, we were able to drive through Twin Falls after the morning rush hour. It got quite windy during the drive and we had some rain showers. We stopped at the Love’s truck stop in Wells, NV for our lunch break. Adjacent to the truck stop, there is a big empty field where Prince could enjoy a short off-leash walk. We had a bowl of chicken noodle soup for our lunch and then bought a couple of sweetened/flavored coffees to enjoy during our afternoon drive. The mountains along the highway had snow on the tops and low clouds. It appeared that snow was still falling at the higher elevations. Shawn had to work harder to drive with the crosswinds. Today was really the first day that the wind was a factor in the driving. Our Country Coach Affinity is pretty heavy and it takes a fair bit of wind before it becomes a challenge to drive. However, it is particularly susceptible to gusty conditions on the side of the coach. Shawn is getting pretty good at identifying the spots where a wind gusts are likely to push us around. However, every once and a while, he will get surprised. Driving in these conditions is the most tiring for Shawn. He needs to be paying attention all the time and be ready to react quickly. We stopped at the KOA campground in Ely NV for the night. This is a frequent stopping place for us. There are good trails which allow us to enjoy some easy hikes right at the park. The campsites are a little shorter than some of the newer parks, but the lanes are very wide so they allow a little hang-over of the motorhomes with tow vehicles. We unhitched our Jeep after Prince had a short walk and we went to the grocery store in Ely to get a few items that Corinne wanted to use for dinner. We got back from our short trip into town and Corinne cooked some Southwestern Turkey Meatballs which were very good. A huge benefit of traveling by RV is the opportunity to prepare all our own meals. Planning meals takes a little more thought than at home or on the boat since there is a microwave /convection oven that is not very good. So more of the meals need to be made on the stoptop. We put on a DVD movie for the evening while we sipped a cup of tea. It was nice to be warm and cozy inside. We were up at O’dark thirty (6:00am) today. Shawn seemed ready to get up and Corinne wasn’t likely to fall back to sleep. Shawn was actually surprised how alert he felt. Sometimes the driving, especially in bad weather can really tire him out. However, we didn’t try to push the distance too much yesterday and we did stop early enough to get some exercise. We had a quick shower this morning and then left with Prince for a walk. Our first stop was the local Starbucks and then we strolled the large block around the neighborhood and back to the RV park. We completed our morning chores and hooked the Jeep back on the RV. By 8:00 am, we were rolling out to the highway. Due to the dead battery problem we had on our northerly trip, we were being a lot more careful to turn the Jeep off at night and take it for some short trips some evenings. It’s nice to having the Jeep along. It gives us a chance to see a like more. We just park the RV in a safe location and take the Jeep. I think Corinne likes the fact we can pick up groceries and anything that we need without having to maneuver the RV in and out of parking areas. We also tend to take Prince further a-field for walks and hikes. We have become quite adapt at connecting and disconnecting the Jeep. We use a Falcon All-Terrain tow bar system. It was quite gloomy and started raining shortly after we began today’s trip. When we started up the slope into Pendleton, Oregon, it got foggy too. However, the road was almost empty. We like to take the “back way” to Las Vegas. The trip is a bit longer, but the driving is so much easier. We actually enjoy most of the trip, particularly once we change from I-90 east to I-82 south in Ellensberg, WA. The rest of the trip to Las Vegas is very easy, with little traffic and fairly interesting scenery. We stopped at a rest stop north of Baker City for our lunch break. We had chicken salad sandwiches with dried cranberries, apples, and walnuts from some chicken leftovers. It was a nice lunch. Being able to have lunch on the RV really makes it a lot easier for Shawn to maintain my weight. The avoidance of fast-food and diners keeps his blood-sugar on track as well. Having our own bed to sleep in and regulated meals really helps us feel fresh and relaxed during the trip. After our lunch break, Prince had a short walk around the rest area. It was cold and windy and not a very interesting spot to walk. So we didn’t spend much time outside before we hustled Prince back to the RV. By 1:00 pm, we were traveling southeast again. South of Baker City, near Rye Valley, we saw a nicer rest area; possibly a place we could use on another trip. As we continued southeast, it began to rain. It was fairly unpleasant, but not a downpour. Again, it was cold and the road was pretty slippery. Fortunately there was no wind and the traffic was very light. We continued to Mountain Home, ID where we decided to stay at the Mountain Home RV Park for the night. This was about 40 minutes west of Glenns Ferry, where we often stay at the Carmela RV Park. It seemed better to stop here since we had lost an hour due to the time zone change. The last time we tried a park in Mountain Home, it was in a less than attractive neighborhood. This park was easy to get to from the highway and had nice concrete RV pads. The lanes accessing the sites were sufficiently wide for Shawn to easily navigate with the Jeep still attached. There was a beautiful rose garden in the center of the entrance driveway. Each camp site had a nice grassy spot and picnic tables. There were lots of pull-through sites which were quite long. There is a city park in Mountain Home which appears to be within walking distance, but it was too cold and rainy to get us interested in a long walk. 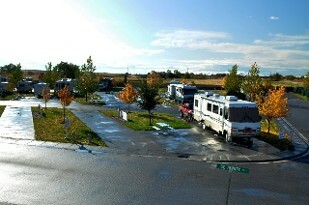 If you arrived late, there were nice RV spots which are left vacant close to the office. The night spots are marked with blue lights. Next to the RV park, there was a Chinese food restaurant which the park staff said was good. The park staff were also very nice. This was the first time one of the park staff at any park we have stayed at offered to connect the RV to the power and water. When we got parked, we took Prince out for a very short walk in the rain. There was a large empty field at the end of the RV park where we walked. Once we got back to the RV, we heated up some chili for our dinner. During the evening, Corinne used the wi-fi coupon from the RV park staff to do some work on our blog and check for RV parks for tomorrow. There was a good Internet signal. Today was the start of our southbound trip from Anacortes to Las Vegas. We didn’t want to deal with rush hour traffic through Everett, Kirkland and Bellevue, so we didn’t start our travels until 9:00 am. It was cloudy this morning and as we got to I-5, it started to rain. It rained most of the morning, but lightened up after we got east of North Bend. Not only was it wet, but it was also cold. The roads were slippery, mostly from the rain, but as we got up in elevation, the icy-feel increased. We stopped just east of Cle Elum at a rest stop for a lunch break. It was a good stop for a break. The dog walk area had a little dirt trail which followed along a fence line and then within a small copse of trees and shrubs. Prince seemed to enjoy his exploration time. Prince was doing much better on the RV than he had in the past. He seemed much more settled and dosed for most of the trip. We continued east and drove through little rain showers. Around 3:30 pm, we stopped at The Wine Country RV Park in Prosser WA. Ah! We arrived in time to disconnect the Jeep and zip down the road to the Chukar Cherry warehouse store for some tasting and shopping. We found much to enjoy there. We have such different ways of shopping. Shawn’s method is very simple; taste and then buy one of everything. Corinne has to think about each purchase. Shawn wonders if this process causes Corinne pain, since it seems she almost goes cross-eyed with thought. Prince waited patiently for us in the Jeep, always happy to stay close to us. Then, it was his turn for some fun. We found a small city park adjacent to a little working class neighborhood. We walked around the park and then expanded the walk into the housing area nearby to stretch our legs a little more. When we looped back to the park, Prince spotted a squirrel scampering toward a large maple tree. That was good for a short chase; we have to keep the hunting skills honed. It started to rain again so we hustled back to the Jeep and returned to the RV to make some dinner. Tonight we had some leftover salmon (from yesterday’s dinner) in an egg scramble with some nice sharp soft cheese. The days are short with the fall season well underway. By 7:00 pm, it was as dark as the middle of the night. Time to put up our feet for the night. The day did not start so well. In addition to heater problems, our coffee didn’t start to brew automatically as it usually does. Corinne set the coffee to come on at 7:30 PM rather than 7:30 am. I think we both thought that we were in for a difficult day! We check the weather and determined that the temperatures were going to drop, with highs at 1 degree and snow expected. Without a working furnace, this helped us decide that we just didn’t belong in Flagstaff. It took us most of two hours pouring over our travel guides and iPad RV apps to finally decide that we should get down near Phoenix. It would get colder there, but no where near as cold as Flagstaff. The problem was that we didn’t want to be in the city. We eventually settled on trying a small town just north of Phoenix called Black Canyon City. Once we decided where we wanted to go, it did not take us long to get ourselves moving. Much to our relief, the day went fine. It was a very easy drive down (7,400 ft to 2,000 ft in elevation). We settled in at the Bradshaw Mountain RV Resort. We couldn’t reach them by phone (it is the holidays), so we were not sure what we would find when we arrived. What we did find was that the staff had left a map of the resort with all the available spots. We took Prince for a walk and eventually settled on one that had relatively easy access and no overhanging trees. The turns are a little tight for pulling the jeep, so we unhitched it and caravanned around to our spot. Corinne helped me back in and in short order we were settled. After a little lunch of Prime Rib leftovers that was enjoyed by all three of us, we headed off in the Jeep to explore. Corinne had researched the area on our way down and thought there was a hiking trail at the south end of the town. She was right; the Black Canyon Trail has an entrance just off the west side of the highway’s frontage road just south of the town. It was well marked and easy to find. As it turns out there are actually 2 trail entrances. The Black Canyon Trail stretches from Phoenix to Prescott with a length of about 60 miles. A second smaller nature trail called the High Desert Trail also has an entrance just to the right of the Black Canyon Trail (the nature trail is the one that does not allow horses). Not knowing any better, we struck off on the High Desert Trail. It turned out that fortune was smiling on us as this turned out to be a lovely loop trail for an afternoon walk. It meandered up to the top of a ridge and then proceeded to follow the ridge providing the walker with a number of spectacular views. It eventually worked its way down the ridge and into a cactus forest. All of the well known cacti were represented; Teddy Bear Cholla, Saguaro, Prickly Pear, and Hedge Hog. We even walked through a Cholla fruiting forest. Of course there were other desert plants present, but the cacti were very impressive. The trail took us about 45 minutes to walk but we stopped quite a bit along the way. There were a number of benches set up for people to have a sit and rest. Prince enjoyed the slower pace as he had time to hunt for “mice”. The afternoon was so lovely that we decided to do a little exploring by car. On the west side of the Highway 17 frontage road we had noticed a series of very old buildings. The parking lot was full, which of course meant we needed to know what was so popular. We found the Rock Springs Café and Pie Company. Well we simply couldn’t go by without sampling the wares. A piece of Tennessee Bourbon Pecan and Peach Cobbler later, we were ready to explore the little market that was housed in the adjacent building. A jar of locally made “Mesa” honey was acquired and then we were on our way. We also found the local Chamber of Commerce which had lots of information and brochures about the tourist highlights in the area. The young man volunteering at the office was very helpful and Corinne came out armed with a stack of maps and brochures. I am sure these will figure prominently in our travels tomorrow. We were up a little later this morning. We were all a little tired from the outings yesterday. However, the smell of coffee brewing and with little coaxing from Prince it was not long before we were up and on a little walk around the RV Park/Marina. It turned out to be a pleasant morning for the walk. We started on the walk under some pretty dense clouds but it wasn’t long before the sun pushed them off. Prince saw several bunnies, but being on the leash was not able to give adequate pursuit. It is the ultimate in torture for Prince. We walked up to and around the hotel at the resort. It is quite a large facility that is mostly closed for the winter. There were a few guests but none of the restaurants were open. We could hear someone working on the boats in the marina and the garbage truck came through, but otherwise it was pretty quiet. Corinne made oatmeal for breakfast and we did some chores. It wasn’t long before we were ready to saddle-up and head for Flagstaff, AZ. It was a pretty uneventful trip until we got to Flagstaff. However, we ran into a little direction problem getting to the RV Park (Black Bart’s RV Park). This resulted in me taking a turn that I couldn’t make and needing to take the Jeep off its tow system while blocking traffic. The good thing is that I am pretty good at taking the Jeep off and that I stopped before I got us into real trouble. For those that are wondering why I couldn’t just back up, the towing system for the jeep does not allow for backing up. It is a great system in all other ways except when you don’t adequately plan your turn. The RV, being 40 feet long and the jeep adding another 15 ft can be pretty challenging to maneuver in a tight spot. Further complicating the maneuvering challenge is the fact that the back wheels don’t follow the front wheels. So, it is pretty easy to find yourself in a tight spot. Taking the truck driving course really helped me to judge distances and where my back wheels are going to go when I go around a corner. The other complication is that you are sitting on the front wheels. When they turn they tend to point the bus directly at the point of the turn. So you need to remember that you need to go out and around the turn and not through the turn like you would in your car. At the same time, your back wheels will tend to cut the corner. That means that large rounded turns are required. Occasionally, the way a lane will set up the turn makes this very difficult. You have to go wide to avoid the traffic but if you go too wide, you end up not being able to get around the turn. That’s what happened today. I got too wide in the turn avoiding a car and couldn’t get the front end around before I was smack up against a curb; a big miscalculation on my part. We got the Jeep off with little trouble and I was then able to back out of my predicament. Corinne then took the Jeep to find the RV Park and called me with directions when she had it located. It turns out that the GPS gives Black Bart’s location as about 0.5 miles south of its actual location. Once we arrived and got settled, we took Prince for a walk around the park. He likes to see where he is and get his bearings as soon as we arrive. He will continue to agitate for his walk until we capitulate. After we got Prince walked and fed, we went off to have steaks at Black Bart’s restaurant. What Corinne failed to tell me is that it was Black Bart’s Steakhouse and Musical Revue. So I was quite surprised when the serving staff ran up on the makeshift stage and started belting out tunes from famous musicals. They were good singers and very entertaining. We heard songs from Les Miserables, Show Boat, Lion King and Oklahoma. Consequently, we had a very nice evening of music and very nicely prepared steak for Corinne and Prime Rib for me. We even topped-off the evening with a serving of Apple Crumble a la mode. After dinner, we took Prince for another short walk under a star lit sky. It was about 25 degrees. It was very cold and the water and soil had frozen. We did a relatively short loop around the park. When we went to bed, the furnace was working fine and keeping the RV nice and warm. However, some time about 2:00 AM the furnace quit. It was in the teens outside and the RV cooled down quickly. I tried to use the overhead heaters but they won’t work below 34 degrees. So I had to break out the portable space heaters that we used on the former RV. They managed to keep the RV acceptable warm for rest of the night.